Source: Adapted from Urick, 1983; Principles of Underwater Sound, 3rd edn; reproduced with permission of McGraw-Hill Publishing Company. Note a The reference intensity is that of a plane wave of rms pressure 1 [xPa. In this application, recognition differential (RD) replaces detection threshold (DT) as used by Urick (1983, chapter 12). 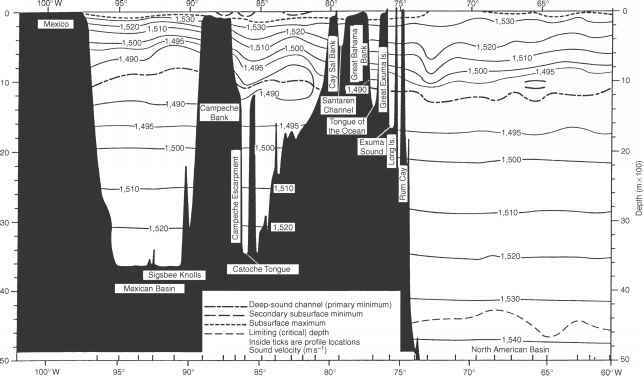 Dawe (1997) distinguished the modern usage of RD in sonar modeling from its obsolescent usage in relation to auditory detection. The concepts of DT and RD are related to each other through the level at which a signal can be detected for a given combination of probability of detection (Pd) and probability of false alarm (Pf). The difference between DT and RD relates to the location in the information-processing chain at which the threshold signal-to-noise ratio (SNR) is effectively measured. For DT, the SNR is measured at the receiver input terminals. For RD, the SNR is measured at the display. Furthermore, RD has been subscripted in the case of active sonars to make it clear that this parameter is quantitatively different for noise (N) and reverberation (R) backgrounds. The sonar equations are valid for the condition in which the signal excess is zero. Beam pattern functions are implicitly included in the TL term. The apparent simplicity of the individual components of the sonar equations can be misleading. The complexity of these parameters will be better appreciated through the discussions to be presented in Sections 10.3 and 10.4. These equations are valid for sound levels in a 1-Hz wide frequency band (referred to as spectrum level). For frequency bands greater than 1 Hz, the sound levels in Equations (10.1), (10.2) and (10.3) must be corrected for bandwidth (e.g. Kinsler et al., 1982: 409-17). It is convenient in practical work to assign separate names to different combinations of terms in the sonar equations. A summary of commonly used terms is presented in Table 10.2. The combination of terms labeled FOM is the most useful because it combines environmental, sonar and target parameters into one convenient quantitative measure of sonar performance. Since the FOM quantitatively equals the TL under the conditions specified in the sonar equation, the FOM can give an immediate indication of the range at which active or passive sonars can detect targets provided that corresponding TL curves are available. When using the FOM in this manner, it should be stressed that the TL curves must match the ocean environment, acoustic frequency, sonar depth, target depth and other sonar parameters used in computing the FOM value. In the case of active sonars that are reverberation (versus noise) limited, the FOM is not constant but varies with range (time) and thus fails to be a useful indicator of active sonar performance. The parameters listed in Table 10.1 can be related to the functions of basic acoustic models. Specifically, propagation models generate estimates of TL, noise models predict noise levels (NL) and reverberation models provide estimates of the RL. For passive sonars, the sonar equipment will define directivity index (DI) and RD while the target will define SL; TS is not considered in purely passive sonar models. For active sonars, the sonar equipment will define SL, DI and RD and the target will define TS. Source: Adapted from Urick, 1983; Principles of Underwater Sound, 3rd edn; reproduced with permission of McGraw-Hill Publishing Company. of papers that reviewed past progress and future challenges in underwater acoustic signal processing. Specific applications included sonar signal processing, time-delay estimation and underwater acoustic communications. 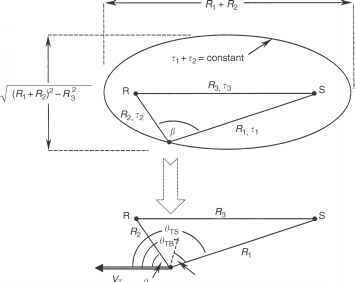 Figure 10.1 Bistatic geometry (adapted from Cox, 1989). By reference to Figure 10.1, the equivalent bistatic aspect angle (0E) is defined as cos 0 TS + cos 0 TR . cos 0E =---= cos 0 TB cos .